A psychological drama thriller, Falling Down portrays one man's journey past the edge. In Los Angeles, middle-aged defence industry white collar worker William Foster (Michael Douglas) finally loses patience with a slow moving traffic jam caused by roadworks. He abandons his car and walks off with his briefcase, mumbling that he is heading home. The incident is witnessed by police Sergeant Martin Prendergast (Robert Duvall), who is retiring that day, having yielded to excessive nagging by his wife Amanda (Tuesday Weld). Foster is in the throes of a full-fledged mental meltdown. Despite a restraining order he phones his ex-wife Elizabeth (Barbara Hershey) to tell her he is on his way because it's the birthday of their young daughter. On the long walk to Elizabeth's Venice Beach house he first tangles with a Korean shopkeeper then with members of a Hispanic gang, an altercation that provides him with a gym bag full of weapons. He then causes panic at a burger joint. Prendergast and Detective Sandra Torres (Rachel Ticotin) start to connect the dots about the strange man leaving a trail of carnage in his wake. Directed by Joel Schumacher and written by Ebbe Roe Smith, Falling Down brings to life the secret rage of men who have had enough. With just a touch of humour and plenty of barely controlled fury, Foster plays out what many in his position may wish to do. Unable to dust himself off and try again, this is a defeated man comprehensively slipping over the sanity threshold and now looking for all the wrong answers in all the wrong places. It's a serious mental anguish topic, and despite some exaggerated episodes the film does not shy away from the destructive consequences, both in terms of self-harm and the pain and suffering inflicted on family and innocent bystanders. With both his career and his family life seemingly at an end, Foster's inner demons are unleashed. He uncorks bottled-up racist thoughts, violently destroys a corner store over the cost of a pop can, and refuses to accept petty restaurant schedules for when breakfast can and cannot be served. He lives out the macho dream of having an arsenal at his disposal. And rocket launcher at the ready (with a kid proving how-to instructions), he challenges construction workers to explain, why exactly, the street is being torn up. Schumacher alternates scenes of Foster's progress towards Elizabeth's house with Prendergast's long and messy last day on the job. The Sergeant first witnesses Foster's rough start to the day and then begins to hear about strange incidents involving a man in a white shirt and necktie instigating altercations in neighbourhoods where such men are not supposed to tread. The structure balances the film, breaks the monotony and allows Michael Douglas and Robert Duvall to share the screen time despite not meeting until late. 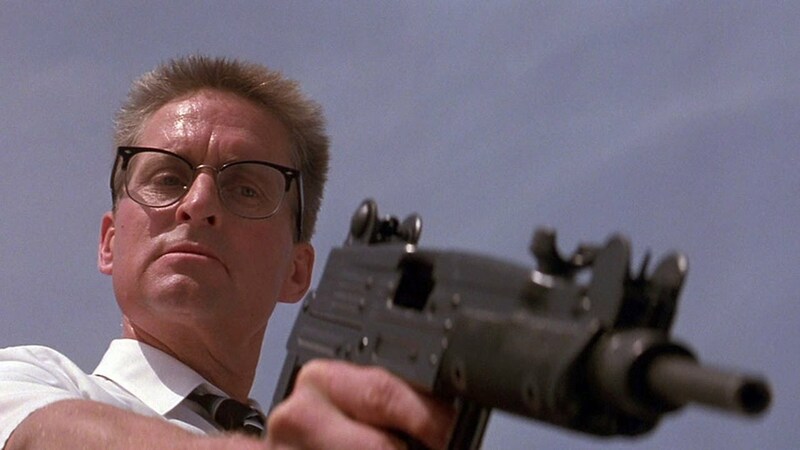 Falling Down walks a fine line between important and exploitive. William Foster is everyman on a really bad day, giving way to worst tendencies that are sometimes, sadly, just too powerful to contain.